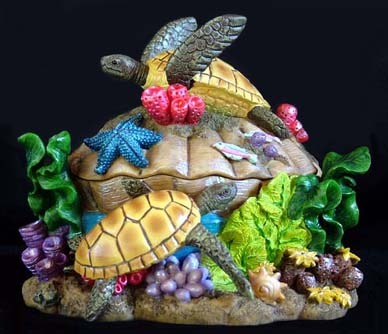 This stunning Sea Turtle Keepsake and Jewelry Box will bring a unique and artistic addition to your home or office. Handcrafted with the finest details and materials, this piece of functional artwork will bring a lifetime of enjoyment. A wonderful gift for a friend or loved one as well! It can be used for storing Jewelry, precious Baby Keepsakes and other valuables. 5 inches W. x 4.25 inches H.